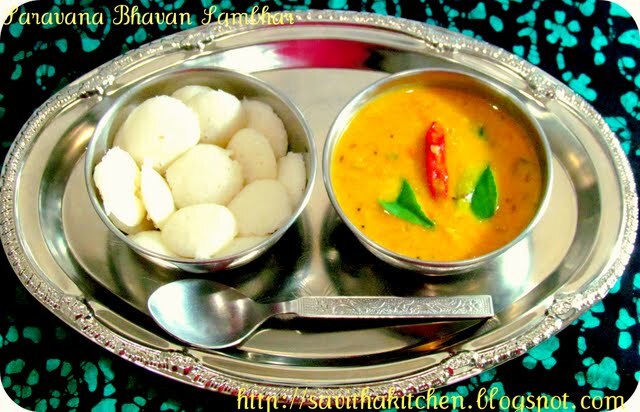 I am a very big fan of Saravana Bhavan Sambhar.we used to order sambhar idlies,where cute mini idlies will be floating in a pool of sambhar.we will literally drink the sambhar .It wud be a perfect match made in heaven.I was frantically searching for this recipe.When I saw the recipe in geetha's space,cudn't stop myself from trying this.Geetha has beautifully explained the recipe in her post here .I have altered a bit.Also I have added sugar as a flavouring agent at the end,to bring out the real taste of retaurant.Its almost 3 years,I tasted this sambhar.It was too good to have with idlies.I prepared today mini idlies . 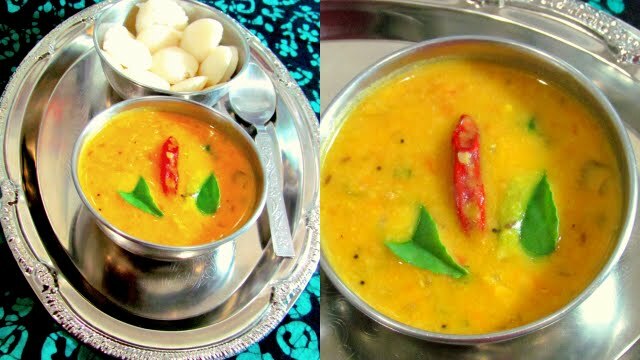 * Take a pressure cooker,add toor dal,finely chopped onion,tomato ,bit turmeric pwdr and cook with water for 3 whistle.After the whistle is relaesed,mash the dal roughly and keep it aside. * Grind all the ingredients under "for grinding " into a fine paste ,adding little water.We can also use shredded coconut ,instead of using whole coconut. * Take a pan or kadai,add oil and temper with mustard,cumin ,curry leaves and methi seeds.When it splutters,add the chopped onion and green chillies.When it is sauteed well,Add the cooked dal into the pan and bring it to boil. * When the mixture comes to sizzling boil,add the grinded paste,cover and cook in low for 10 mins. * When the sambhar is cooked,add red chillies ,curry leaves and cilantro and turn off the stove.Cover the sambhar,as the aroma will be retained.This step is very essential in bringing the taste of restaurant style sambhar. * At last ,add sugar and mix.This is purely optional,but this is a restaurant touch.Serve with idlies,dosai or pongal.Perfect match for these tiffins. The colour of the sambaar is very beautiful. I too love sarvana bhavan sambaar..bookmarking this recipe. Tempting sambar looks so delicious.Beautiful clicks.Awards are waiting for you in my blog my dear. my favt breakfast..looks grt.before coming to uk atleast once in a week i used go to saravana bhavan and used to eat this tasty n delicious combo..thanks dear for sharing ..
aaha- paakava arumaiya irukku; kalakiteenga ponga! Lovely and mouth watering combo.. would love it anytime... So delicious.. I do order always their sambar vada and idlis, droolworthy sambar...simply makes me hungry..
wow! superb,thanks to both of you..
Thats really a meaningful recipe to try.I loved the recipe.Who can forget saravana bhavan food ? Those cute idlis look heavanly too ! Wow sambar looks so colorful and delicious..
Hi. First time here. Saravana title hooked me and brought me here. Love the look of this Sambhar. Homely and inviting!!! Pictures tempting me dear..perfect combo.. 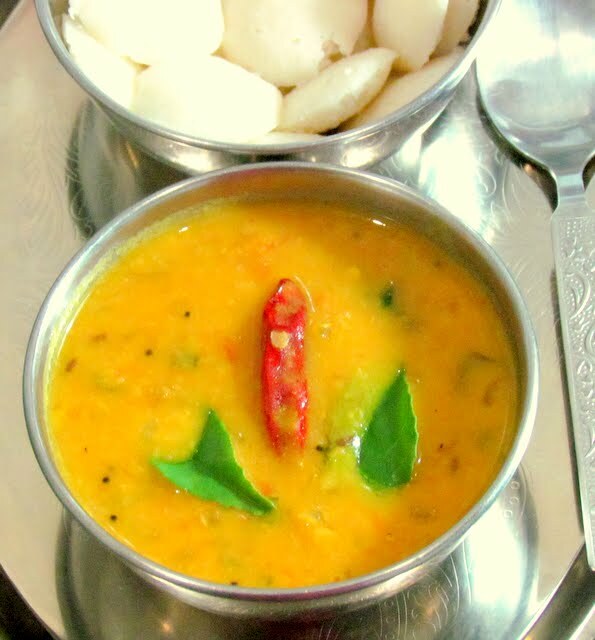 Your sambar and idlli looks too tempting.I am bookmarking this sambar recipe. What a lovely dish, so inviting! 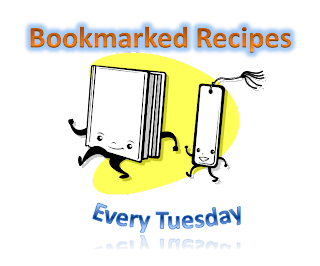 Great blog, full of vegetarian recipes too, I am following you! looks very inviting! must try recipe...thanks for sharing.. my favorite.. Thanks for stopping by my blog. Lovely space and drooling pictures :) Happy to follow u.
vaasam enga varaikkum varuthu savi. we love to drink our sambhars just out of the pan. this one looks so bright and mouthwatering. thanks for taking the effort to stop by Savitha :) . Love your blog. Love the saravana bhavan sambhar..so yummmmmmmmmmm! following you now! so tempting de savi..flavourful masala sambar..
Looks so aromatic & flavorful!!! Loved the color!! who can say no to mini idlis in sambar!...tempting clicks! loved to eat at sarvanna bhavan when we were in chennai. the combo looks super tempting!! Tempting sambhar..dt too from saravana bhavan,oh!yummy ..
Pls post rice sambar tooo. Thanks for trying this sambhar and conveying your comment.will surely post sambhar for rice too. Hi this is cappu, i loved your sambar and made 100's of times...so far. Please post the saravana bhavan Rice Sambar, kootu recipe, kaara kuzhambu recipe and poriyal recipe, plssssssssssssssss. I especially need rice sambar recipe first. Expecting soon. Pls post it. Thanks for trying my sambar . Will post rice sambhar sure next week,as I am on vacation and just publishing the drafts.Thank u very much.I appreciate ur patience. Hi anonymous,thanks for ur comments.This is not the exact Saravanan bhavan sambhar.I have mentioned it ,its a style of saravana bhavan.It tasted almost like it.No chef will gove out thier secret,so does the hotel.Any way thanks for ur pain in commenting. Hi, Chilli pdr here refers to home made chilli pdr (kulambu podi) or red chilli pdr (Milaga vathal podi)???? You can use kulambu milagai thool.